SBA offers a variety of fall, winter and spring sports for boys and girls. As members of the SDHSAA, the Crusaders compete against public schools, tribal schools and private schools. Cross Country is a fall sport for boys and girls. The Cross Country squad is coached by Greg Pedersen. Football is a fall sport for boys. The football team is coached by Jamie McClain and Jason Burma. Volleyball is a fall sport for girls. The volleyball team is coached by Stacey Rickard and Lindsey Hettich. Wrestling is a winter sport for boys. The wrestling squad is coached by Jason Burma. The Lady Crusaders are coached by Lindsey Hettich and Ja Lynn Burma. The Crusaders are coached by Jamie McClain and Lucas Hall. Girls track is a spring sport. The girls' track squad is coached by Greg Pedersen. Boys track is a spring sport. The boys' track squad is coached by Jamie McClain. 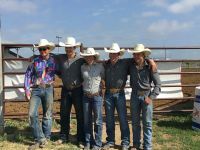 Rodeo is primarily a summer activity, though there are some events in the late spring. Joanne Young is the adviser for the Rodeo Team.